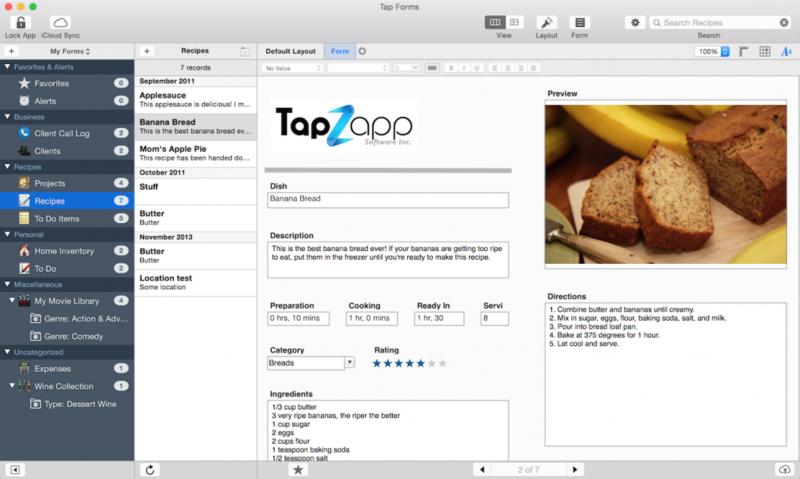 Tap Forms for Mac includes a Bento Template Import command to help you migrate from Bento to Tap Forms. 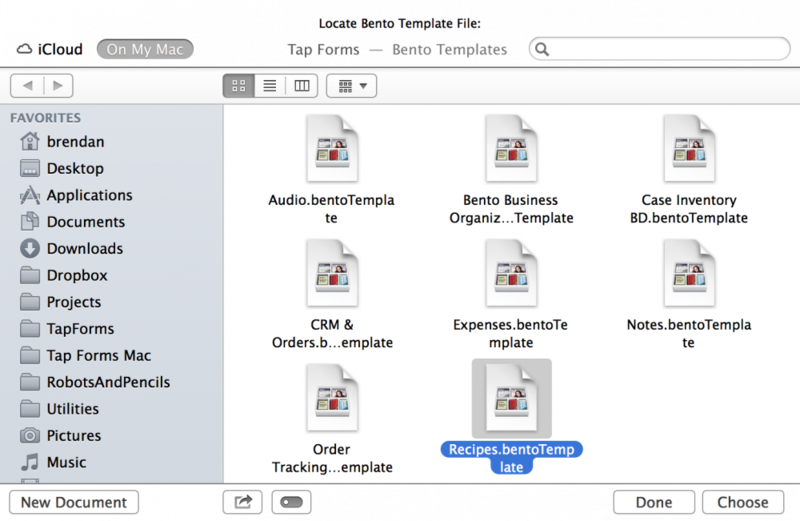 Bento has been discontinued by FileMaker and is not fully compatible with OS X 10.10 Yosemite. !Tap Forms will import Bento 3.0 to 4.1 version templates. 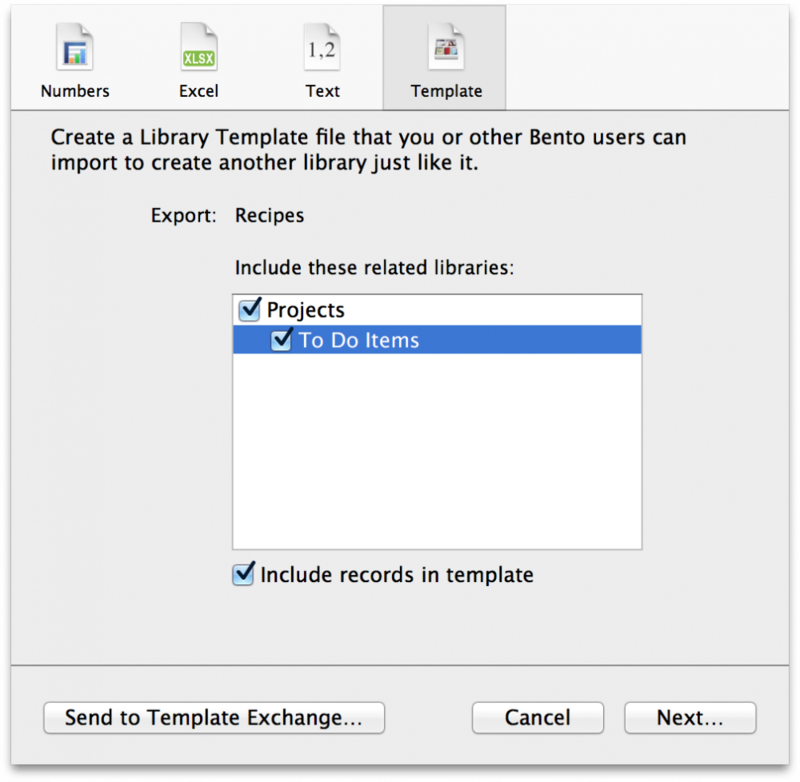 However, you will need version 4.0 or higher of Bento in order to be able to export your Bento data along with your templates. One other caveat is that if you’re using a version of macOS higher than Mavericks, you may experience an issue where Bento says “Upgrading Database” but never completes the job if you’re upgrading from Bento 3. If this happens to you, you will need to find an older version of macOS to perform your upgrade. 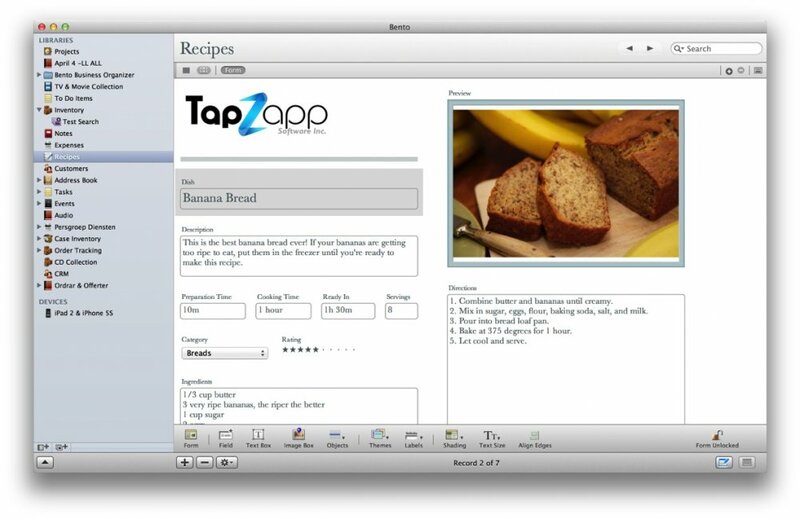 Alternatively, send a Bento 3 backup file to support@tapforms.com and I’ll covert it for you. I have a copy of macOS 10.9.5 Mavericks running inside a Parallels Desktop virtual machine that I use for this process. If you need the 30 day trial version of Bento 4.1.2 in order to convert your data, please email me. 1. Launch Bento and select your library. 2. Select Export… from the File menu and choose the Template option. Make sure you click on each related library displayed in the “Include these related libraries” list if you want Tap Forms to be able to join your related forms together. Also click on “Include records in template” if you want Tap Forms be able to import your Bento data also. !If you don’t see the “Include records in template” option, then you’re not using the latest version of Bento. You’ll need to download that first before proceeding. The link is at the top of this page. *If you have any encrypted fields in Bento, you will need to change those in Bento first to unencrypted Text fields before you export the template. The encrypted fields will not import into Tap Forms. 4. Launch Tap Forms, create a new empty document or open an existing document you’re using, and select the “Import Bento Template” command from the File menu and select your Bento template file. *If the Import Bento Template option is greyed out, please make sure you have a document already opened and that document is in the foreground. Click the Choose button when you’ve found your Bento template. Tap Forms will now import your template and records. If your template contains more than one related form, Tap Forms will automatically create a new category for you and put your related forms together inside that category. The category will be given a name based upon the file name of the template you are importing. You will need to expand the category to view the forms by clicking on the triangle just to the left of the category name. *Once you’ve imported your Bento template, you can click on any of the layouts that Tap Forms generated from the Bento library. You may need to reposition some elements and/or make some adjustments to the font sizes and styles. Also, the Date Created and Date Modified fields are usually the first fields that get imported, so if you don’t want them there you can just delete them in Tap Forms or move them down the list of fields in your form. Otherwise they’ll be the first two fields which show up in the records list view. Most likely not the desired result.